Discover BoRuo of fine and fashion jewelry. Our team of designers and manufacturers deliver the pieces you want to our quality levels and for our great price. We believe in limited cost and unlimited possibilities. We have the best guarantee in the business on or off Amazon. We only focus on online business and so we pass on the savings we get on no rent and other bills to YOU our valued customer. 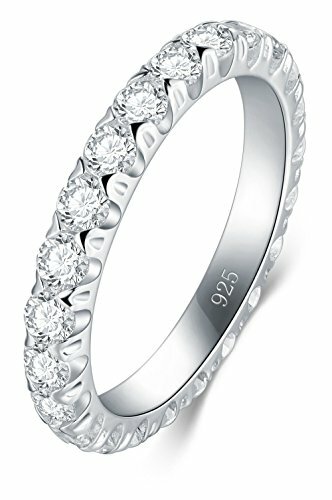 This classy sterling silver wedding ring features 3mm Wedding Band Stackable Ring with sparkling cubic zirconia in prong setting. This plain stacking ring is a must-have for every jewelry box. It can be worn on its own for a sophisticated and simple look or among your beloved stacking rings to make them stand out. Please make sure the correct size before place the order to avoid Return or Exchange. The paper measurement is intended for reference only. We would like to suggest you have your finger sized at a jewelry store for an accurate ring size. The BoRuo Advantage: BoRuo is a member of a very small number of brands invited to the Amazon Fine Jewelry category and all our products meet amazon Jewelry Quality Assurance Standards. Only those with brand strength and excellent products are eligible to enter this prestigious level. Best Gift for Man/women/girls/ Girlfriend/ Lovers/Couple/Mom. Best Birthday Christmas Mother's Day Valentine's day Present Ever!!! Makes a wonderful gift for any occasion,Comes with a Eco Friendly Cotton bag . What You Get: Boruo Sterling Silver jewelry coming with an Eco friendly Cotton bag. Our 60-day satisfaction guarantee and friendly customer service, No questions will be asked if you are not completely satisfied with the product and want to return it. Please choose the correct size before place the order to avoid Return or Exchange. The paper measurement is intended for reference only. We would like to suggest you have your finger sized at a jewelry store for an accurate ring size. If you have any questions about this product by BORUO, contact us by completing and submitting the form below. If you are looking for a specif part number, please include it with your message.